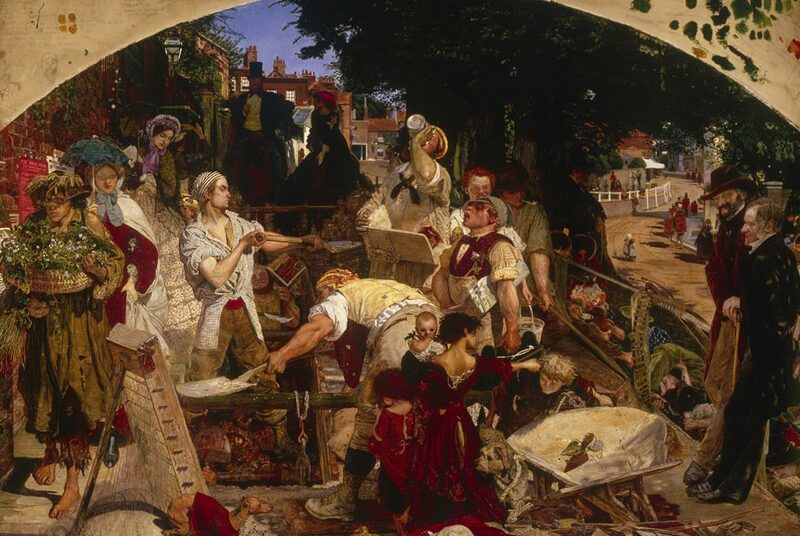 Ford Madox Brown, Work, 1852-65. © Manchester City Galleries. Photo: © Manchester City Galleries. MANCHESTER.- Manchester Art Gallery is staging the first major exhibition of Ford Madox Browns work since 1964. Ford Madox Brown: Pre-Raphaelite Pioneer brings together 140 works from public and private collections to reveal the pioneering role Ford Madox Brown played in the development of Pre-Raphaelitism and explore how the artists rebellion against traditionally taught methods led to a completely radical new style. The exhibitions painting highlights include Browns masterpieces Work (1852  63) and The Last of England (1852  55), which have been brought together for the first time for over twenty-five years. Work, acquired in 1885, was the first Pre-Raphaelite painting bought by Manchester Art Gallery and is being shown alongside a selection of rarely displayed preparatory studies. These epic paintings are unique in Victorian art as they feature social and political themes. Painted with extraordinarily realistic details, these works demonstrate Browns anti-academic attitude and his strikingly unsentimental approach to portraying the social problems of the age. The exhibition examines the six years that Brown lived in Manchester, a city in which he was actively involved in both artistic and social issues. Related works on display include portraits of Browns friends in the city and studies for his huge decorative paintings for the Royal Manchester Jubilee exhibition of 1887. The culmination of Browns career came with the commission to paint the Manchester Town Hall murals, which he completed in 1893. Original studies for the murals are being on show in the exhibition and exceptional access to the twelve murals has been granted to The Great Hall in Manchester Town Hall for the period of the exhibition. The exhibition is curated by Julian Treuherz, former Director of the Walker Art Gallery Liverpool, and an expert in Victorian art. Divided into eleven themes, the show starts with Browns early career before moving on to look at his radical change of direction following an influential trip to Italy, which anticipated the foundation of the Pre-Raphaelite brotherhood in 1848. Throughout, the exhibition celebrates the extraordinary breadth of Browns artistic practice, displaying his skills as a draughtsman, a narrative painter, a portrait artist, a designer of furniture and stained glass, and an innovative landscape painter of works such as The Pretty Baa Lambs (1851  59), a painting which was groundbreaking for being painted entirely in the open air and even anticipated the French Impressionist movement.